Jose Corteza Locsin was born in Silay in 1891 to parents who came from Molo, Iloilo. He was sent to Manila to study and in 1907 he finished his Bachelor of Arts degree from the Liceo de Manila. Then he studied at the University of Sto. Tomas and finished his degree in medicine at age 21. He was elected councilor of Silay, then a Provincial Board Member and provincial governor of Negros Occidental. He was also elected into the House of Representatives. He was also a delegate to the Philippine Constitutional Convention. Later he won a seat in the Senate where he served his six year term until 1957. He was first married to Salvacion Montelibano whom he had 18 children. He also had 2 children with his second wife, Delia Santiago, whom he married when he was 70 yrs old. This house was built in the 1930s. The library which houses a complete volume of La Solidaridad, among others. His life as a politician can be seen in various photographs taken during the terms of Pres. Garcia to Pres. Macapagal. The original furniture is still being used in the house. In their living room can be found photographs of his family. A Photograph of his 19 children. 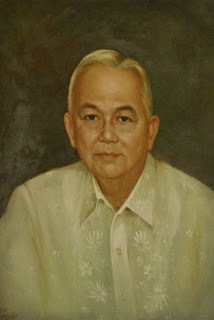 His grandson, Neil Solomon Locsin, was a Consultant for Cultural Research of Silay City. He house continues to be a place where their family gathers on special occasions. Here, he is shown narrating the deeds that this grandfather has done for Silay and the country to the visiting food and travel bloggers.